PRINCETON, N.J. -- Despite the growing focus on inequality in recent years, the 63% of Americans who say that money and wealth should be more evenly distributed among a larger percentage of the people is almost the same as the 60% who said this in 1984. Americans' agreement that money and wealth need to be more evenly distributed reached a high point of 68% in April 2008, in the last year of the George W. Bush administration, and just before the full effects of the Great Recession began to take hold. Americans became slightly less likely to agree with the idea later that year and in surveys conducted in 2009, 2011 and 2013. This year's increase to 63% is close to the average of 62% agreement across the 13 times Gallup has asked the question since 1984. The latest data are from Gallup's April 9-12 Economy and Personal Finance survey. Americans' views on how money and wealth should be distributed in the country are strongly correlated with their partisanship and ideology. Agreement ranges from 86% among Democrats and 85% among liberals, down to 34% and 42% among Republicans and conservatives, respectively. Income is also a factor. Those with annual household incomes of at least $75,000 (54%) are considerably less likely than those with incomes below $30,000 (74%) to agree that wealth should be more evenly distributed. Attitudes vary little by age. The question on the fairness of money and wealth distribution does not include explicit assumptions about the causes of the current unequal distribution of income and wealth, nor does it discuss or imply any particular course of action designed to remedy the situation. Addressing the problem is a moot issue for many Republicans, a majority of whom say the distribution is fair as it is. Most Democrats, on the other hand, presumably endorse some mechanism by which the distribution of wealth and income could be made less unequal. 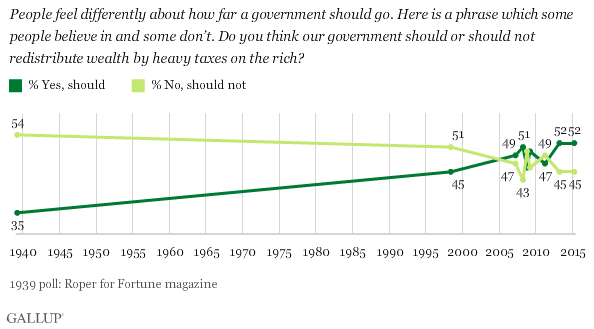 More than 75 years ago, at the tail end of the Great Depression, the Roper research organization and Fortune magazine asked Americans about "heavy taxes on the rich" as one method of redistributing wealth, and found one-third (35%) agreeing that the government should do this. Gallup began asking this question again in 1998, and found Americans' agreement at 45%. Since then, Americans' support for this idea has fluctuated, but has reached a high point of 52% in Gallup's most recent two surveys, conducted in April 2013 and April of this year. As was the case with the basic fairness question, agreement that the government should impose heavy taxes on the rich to redistribute wealth is highly related to partisanship and ideology. Additionally, younger Americans and those with lower incomes are above average in their agreement. Analyzing how Americans respond to both questions about inequality shows that nearly half of Americans (46%) are strong redistributionists -- in the sense that they believe the distribution of wealth and income is not fair, and endorse heavy taxes on the rich as a way of redistributing wealth. One in four are in essence free-market advocates -- sanguine about the distribution of wealth and income and not supporting heavy taxes on the rich. 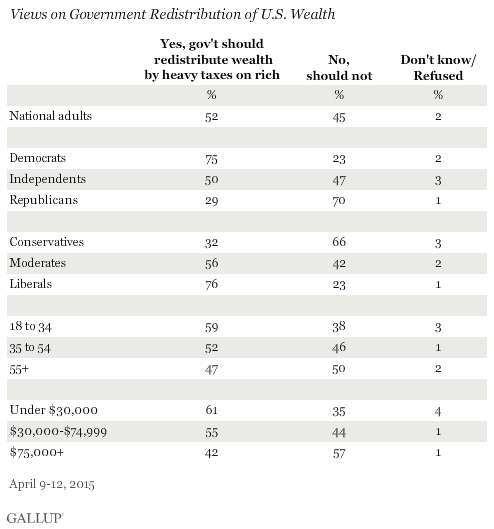 Another 16% say the income and wealth distribution is not fair, but don't endorse heavy taxes as a remedy. A small percentage have the somewhat contradictory views of believing that the distribution is fair but favoring heavy taxes on the rich. Surveys conducted over the past 30 years have consistently shown that about six in 10 Americans fundamentally believe that the way income and wealth are distributed in the U.S. is unfair. Democrats are much more likely to hold this view than Republicans, helping explain why inequality has been a major focus for President Barack Obama, a core part of the presidential campaign of Hillary Clinton, and a primary talking point when Sen. Bernie Sanders of Vermont recently announced his candidacy. Although well less than half of Republicans believe that income and wealth distribution in the U.S. is unfair and that wealth needs to be more evenly distributed, GOP presidential candidates have also begun to address the issue, most likely realizing that the issue has currency with independents, Hispanics and other voter groups that could decide the 2016 election. Additionally, the issue has been more of a talking point in discussions of government policy as many news reports have focused on data showing that income and wealth are becoming less equally distributed across the population than was the case in the past. One way presidential and other political candidates will attempt to differentiate themselves from their competitors concerning inequality will likely be their proposed remedies for it. Democrats have generally been more likely to endorse government policies designed to reduce the wealth at the top end of the socioeconomic spectrum and help increase it at the bottom. Republicans have been more likely to endorse mechanisms that would make it easier for those at the bottom to move up the economic ladder by their own initiative. Still, given that a not insubstantial 29% of Republicans agree with the idea of heavy taxes on the rich, and that a Republican presidential candidate has to assemble some votes from outside of Republican ranks to win a general election, candidates from both parties will most likely consider a wide spectrum of choices or ways of addressing inequality. Although a majority of U.S. adults in each income group perceive the taxes they pay as fair, higher- and lower-income Americans have become a bit less likely to say so in recent years. Middle-income Americans' views have been steady. Household income data gathered among 131 populations worldwide reveal that the richest 3% of residents hold one-fifth of the total self-reported income in those countries -- the same proportion the poorest 54% hold.